Fat Freddy, Phineous Freak and Freewheelin Franklin! How's my longterm memory? Or did I just go and look at my stash? One redneck says to another, "Good God Billy Bob, that was the meanest hippie you ever picked!" after they stomped on Freewheelin and broke the five dozen ampules of Amyl Nitrate he had in his pocket! My junior year in high school my Mother apparently thought my reputation needed up grading and bought some jeans character patches, which were popular in the 70's to not only cover holes, but make a statement. 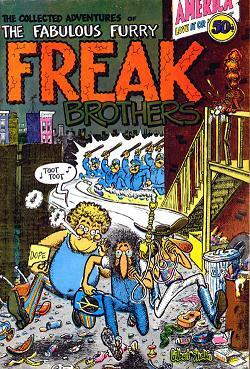 One of these was of the Freak brothers, in their signature pose of one giving the peace sign, one giving the power to the people sign, and of course, one giving the finger. I wore these pants to school at least once a week, and never got called into the office for them. I'm not sure who this says more about; My mother, me, or the school.